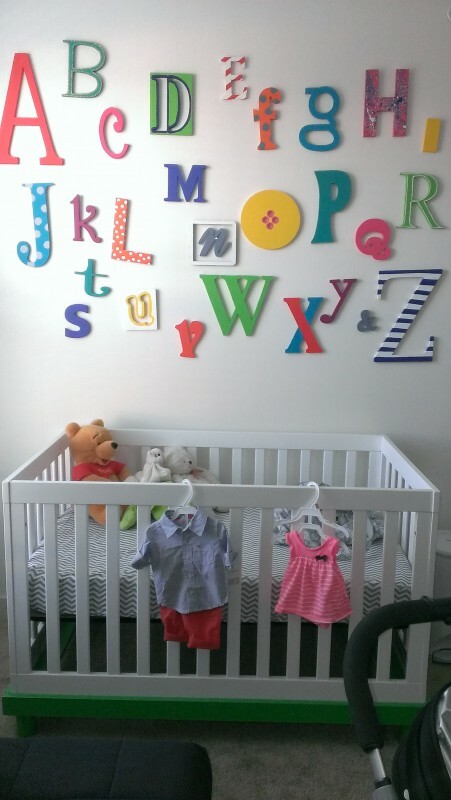 First Pregnancy: Week 27, Baby E’s Nursery is Coming Along! It started out with a succesful dentist Appointment. I personally dread the dentist so I am always relieved when my appt is over and I don’t have to think about that for another 6 months! Right now running is the only thing making me feel normal, so I am doing it as much as I can. I try to still run around 3 miles most days of the week and save 1 or 2 days for some strength training so my muscle doesn’t go to flab during this nine months of pregnancy. Baby E was kicking like a crazy person this week – he/she made up a new starfish move this week where he throws his hands and feet out in all directions and tries to stretch my stomach to the extreme. I wish I had an xray machine to shine on my stomach during different points of the day. All I can think is – what the heck are you doing in there baby?!?!? We went to the Indy Kids Sale and got some awesome prices on blankets and crib sheets, but boy o boy were their some crazy crowds! These mamas are crazy! But you better believe I’ll do it again in the fall, there are some really great deals to be had! We did a big washing day of all of our clothes and blankets we’ve received so far, lots of loads of laundry and lots of clean clothes are wating for Baby E. I’m sure I’ll re wash some of the blankets and sheets before we use them, but it’s nice to have the massive loads done and folded up. Plenty of birthday celebrations this weekend – Joshs dads birthday on Friday and my nephews first birthday celebration on Saturday – both were great to be able to spend time with family! Most exciting is we got the nursery letters up. My nursery is more like a wall with a crib on it, but babies don’t need that much space right? We are in a two bedroom apartment and our second bedroom is our office/guestroom/nursery. It will be interesting since J and I both work form home to see how we transition to having a baby with us and how we manage to still get work done. Most pople ask me what the theme to our nursery is.. I usually respond with Happy. I dont have much of a theme except when I walk in, I want it to exude happiness. I love bright colors and am not a fan of pastels of any shade. So here is the begining, I’ll keep you updated as I add to it! Best moment of the week: Getting the nursery letters up – just looking at them makes me happy. We ordered the wooden letters off of Etsy and then Josh’s sisters and I painted them and decorated them. I am blessed with very creative and artsy sisters! What I’m most looking forward to this week: One last trip to Florida before I am grounded for the thrid trimester. Workouts: P90X and writing on Fitcee Fitness about how I am regressing each exercise for preggos – stay tuned: P90x for Pregnancy! Running every other day as usual still. Sleep: … some nights are better than others, but If I wake up even for a few minutes I can feel baby kickin up a storm and I am usually up with E for awhile. Symptoms: My headaches have gone away in the past few months which makes me happy and my acne is way better in the second trimester vs the first. Ive been lucky not to experience any heartburn or back pain yet. The worst symptom right now is just still pretty tired. I am getting my thyroid re checked next week so we will see if anything has changed with my levels.